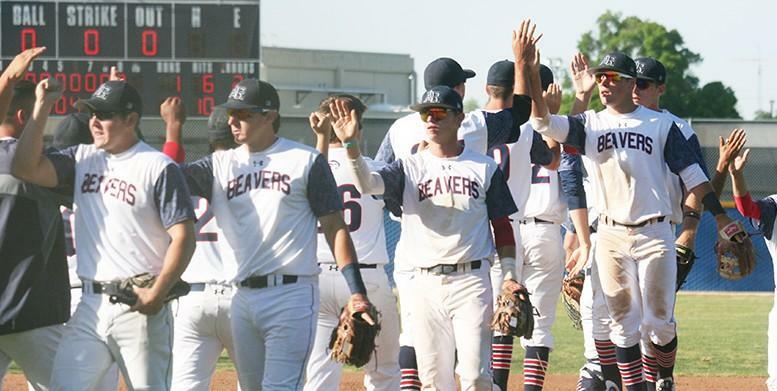 American River College first baseman Dalton Devries was 3-for-4 with two RBIs and a run scored Thursday, leading the team’s offensive charge in a 7-1 win against Sierra College in which five players amassed at least one RBI for ARC. The team is fighting for a playoff spot, and can better position itself if it wins the remaining games scheduled. It was ARC’s third straight win and another dominant performance on the mound, with Mikey Ramirez going seven frames on Saturday and Matt Gunter 8 ⅓ Tuesday. ARC starting pitcher Tommy Balmain (4-4, 4.66 ERA) allowed four hits and one run in eight innings while striking out five. Pitching coach Preston Vancil felt that the recent success of the starters can be attributed to them going back to the basics. 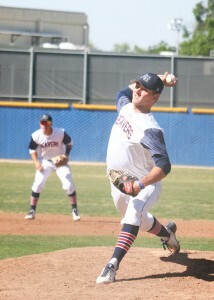 ARC starting pitcher Tommy Balmain went eight innings in Thursday’s win vs. Sierra. It was the third straight game the starting pitcher had gone at least seven innings. Starting catcher Bryan Babcock said the pitchers’ success has rubbed off on the rest of the team. After Balmain allowed Sierra’s lone run in the first inning, ARC took the lead in the third on RBI singles by second baseman Cameron Bennett and right fielder Alex Gaskin. ARC put up four runs in the sixth, including back-to-back triples by Devries and left fielder Jimmy Lunardelli. Lunardelli’s triple was his seventh of the season, the most by any player in the state this season. Devries, ARC’s most consistent offensive threat this season, agreed with his teammate. If the team is able to win today’s game at Sierra and sweep its series next week against last place Diablo Valley College, it has about a 90 percent chance of making the playoffs, according to head coach Doug Jumelet. Winning four out of the remaining five games would require the help of other teams, but not automatically eliminate ARC from the playoff race. Be the first to comment on "Balmain dominant as ARC pushes for playoff spot"